First Team Basketball Hoops from Basketball Hoops Unlimited - BEAT THE BUZZER SHOT CLOCK - Pro and College! BEAT THE BUZZER Shot Clock. College and Pro Settings, 35 and 24 Seconds. Manual and Auto Resetting. Has Real Crowd Noise and Arena Sounds with Volume Control and On/Off Switch. Crowd Counts Down "5-4-3-2-1" and then the Horn Sounds. Mounts to the Pole, Wall or Free Standing. Portable - Perfect for Pick-up Games at the Park or Gym. Weather Resistant. Use Indoors or Outdoors. This item is Free with Selected Basketball Systems! NEW! Beat The Buzzer Shot Clock. 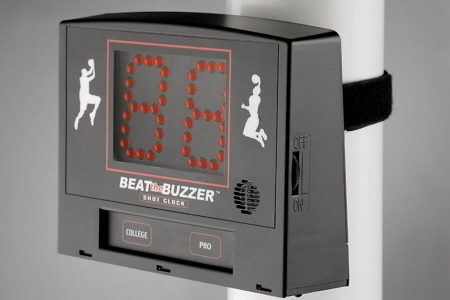 Experience the thrill of College and Pro basketball with our new Beat the Buzzer Shot Clock. Your Fantasy buzzer-beating shots are now a reality as the super bright LED clock counts down to zero and the horn sounds. With real arena sound effects including organ music and crowd cheers basketball at home will never be the same. Requires 6 "AA" batteries (not included but can be purchased from us for $4.99, select above). Low Power LED's will last many, many hours on one set of batteries. Free Shipping right to your curb. This item is IN STOCK and normally ships in 24 hours with an average delivery time of 4 to 5 days. Shipping weight 5 lbs. "Limited Time Offer: Free Shipping on Every Item"